Thank You to Dale Francisco, Miami, OK! 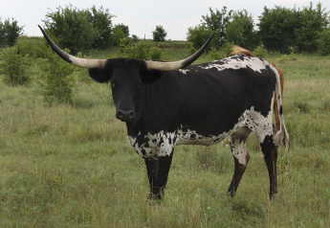 This beautiful black and white own daughter or the great Roundup, is very striking with her contrasting colors and lateral horn. She is very gentle and loves to eat range cubes from your hand. Her solid black sides have some white hairs roaning in and her white coat is turning blue. She has given us some beautiful, flashy colored calves. A great producer!